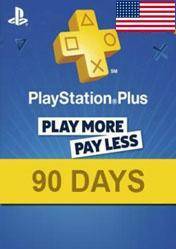 ATTENTION: This PlayStation Plus 90 days card US card is only activated in US. Now you can compare the best prices for the PlayStation Plus cards at online stores. Become a member of PlayStation Plus and you will enjoy lots of games and PlayStation Store content, plus exclusive access to the features of PlayStation Network Premium. PlayStation Plus is a service that improves your PlayStation Network account. By becoming a member of PlayStation Plus, you have access to special offers via PlayStation Store. PlayStation Plus includes advanced games like Trials and Automatic Updates features, allowing you to automatically sync your trophies, receive the latest system software updates, download games and more. PlayStation Plus also includes PlayStation Store special offers such as downloads of demos, discounts, early access to demos and beta trials and other exclusive offers. This prepaid card offers all of these services for 90 days and is only valid for US territory. There are no comments yet about PlayStation Plus 90 days card US . You can be the first one! Pro PC Player Shows You How He Got The Nog Ops + Candy Axe For *FREE* in Fortnite!